Deep in the bowels of the world, there lies a chasm that was sealed over a millenium ago. Within it lies a force of evil so great that, were it to be unleashed, it would plunge the world into a thousand years of darkness. Before you can face that challenge, however, you'll battle your way through dank tunnels, trapped temples, and even volcanoes to prove your worth. You'll face a host of new tricks, traps, and other lethal obstacles over the course of your quest, including scything blades, rolling boulders, and boiling hot lava. Descent: the Well of Darkness features six new heroes, tricky kobolds, bloodsucking ferrox, and unstoppable golems. Heroes will find more skill and treasures at their disposal, including six new relics and a new type of potion. The Overlord, on the other hand, gains the ability to customize his deck before every game, putting in devastating new trap, event, and spawn cards. 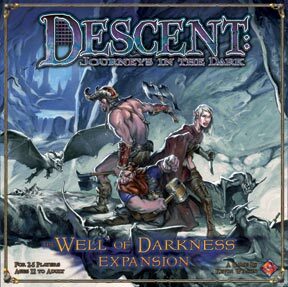 Well of Darkness è la prima espansione prevista per Descent: Journeys in the Dark. L’espansione Well of Darkness include più di 30 nuove miniature in plastica, che rappresentano sei nuovi eroi, coboldi ingegnosi, ferrox succhiasangue e golem indistruttibili. Gli eroi ottengono nuove abilità e tesori, tra i quali tre nuove reliquie ed un nuovo tipo di pozione. Avranno bisogno di tutte queste aggiunte perché il Signore Supremo può ora personalizzare il proprio mazzo prima di ogni partita. Inoltre ottiene nuove carte Spawn, nuovi eventi e insidiosi poteri, oltre a trappole più letali con rocce che rotolano, dardi velenosi e lame a pendolo. Questa espansione presenta inoltre nuove regole per la lava e il fango, due nuovi effetti persistenti (sanguinamento e scosso) e nove nuove quest.